Visit Your Shoreline Dentist, What's Stopping You? What’s Holding You Back From Visiting Your Shoreline Dentist? We know the idea of booking your next dental hygiene cleaning and checkup might be low on your priority list. Many people are anxious about visiting the dentist for a variety of reasons. No matter what has held you back in the past, let us reassure you: Here at Shoreline Dental, we promise to make your needs and comfort our top priority. You already know why it’s important to visit us every six months – not only can regular dental checkups with Dr. Co keep your teeth and gums healthy, they can also help you maintain better overall health. But we’re not going to lecture you on WHY you need to visit. Instead, we’ll address a few of the things that may be holding you back from booking your next appointment. Full-time work, a long commute, running the kids to soccer practice… our Shoreline dental patients are BUSY! It can be tough to squeeze anything extra into your schedule. We understand and are willing to work with you! Additionally, because of advanced technology, many treatments that used to require multiple appointments can now be completed in just one visit! Our office is open Monday – Thursday from 8am – 5pm. We hope to see you! You may be anxious about your dental visit for a variety of reasons. Let us put you at ease! Your concerns are our concerns. We promise to fully explain your options; you are in full control of your choice of treatment. If at any time you’re nervous or uncomfortable in the chair, simply raise your hand and we will take a break. You know you need to visit every six months, but somehow time slipped away and it’s been a year…or two…or more. Now you’re worried that when you finally visit, you’ll get the “raised eyebrow” and a lecture. Let us reassure you – we will not lecture you. Our focus on your needs and care is forwards, not backwards. We are a preferred provider for a number of insurance companies. To see if we take yours, call our office at 206.440.0065. Additionally, we will fully explain the costs associated with your treatment upfront so there are no mystery charges or surprises later. For more information about payment options and financing, visit our Patient Information page here. It’s the new year and a perfect time to turn over a new leaf for your dental health! 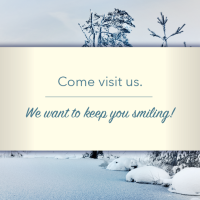 No matter what’s held you back from visiting the dentist in the past, let us put you at ease. Book your appointment with Shoreline Dental, call us today!